We are honored to celebrate our 2nd Anniversary with two very special guests — Joey Beltram and Shy Eyez. 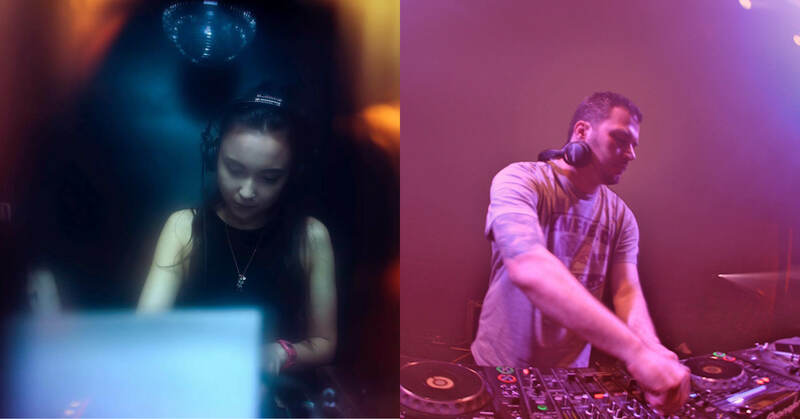 Alyce Currier got the opportunity to talk techno with a veteran and an up-and-coming DJ. Enjoy these two different perspectives of the past, present, and future of techno music and DJ-ing. How have your musical tastes evolved over time? Shy Eyez: The first time I was ever exposed to electronic music was probably when I was 12 years old. I was a total trance addict for a good five years at least! From there, I got into a lot of drum ‘n’ bass, as well as dubstep (i.e. Magnetic Man, Breakage). Eventually I got into house and techno, especially when I studied abroad in Berlin for a semester. I more recently got into U.K. bass, mostly thanks to the Reconstrvct parties. I guess my musical tastes have changed a bit in the last decade or so, but the varying genres definitely still show in my sets! I prefer not to be confined to a specific genre. Joey Beltram: My taste in music has always been more the raw techno sound. But I also listen to stuff outside of techno. In the past, I’ve produced some heavy house music and some electronic/experimental type of stuff. I try to incorporate all the things I like into the techno that I make and play. How does the music you’re listening to casually influence your output? Shy Eyez: The music I listen to very directly shows in my mixes and sets. I actually rarely listen to music that’s not meant for DJing… Something I’m trying to work on. I’m just always looking for new music, especially as I’m starting to DJ out a lot more and do more radio shows. Joey Beltram: If I’m listening to music, it’s usually just for personal enjoyment. I don’t normally let it influence me or guide me into any direction. I’ll just enjoy it in the moment. Where do you go to find fresh inspiration? Joey Beltram: Sometimes just taking a break helps. Taking time off from making music will really get you thinking in different ways when you get back in the studio. When you’re in the studio every day, it’s easy to fall into patterns that can really make the process boring and uninspired after a while. Taking some time off helps keeping the perspective fresh. Shy Eyez: I listen to radio shows religiously; it’s probably how I find most of the music I play. I also listen to a lot of live recordings from DJs I follow. Or I’ll just cruise SoundCloud and listen to mixes from people I’ve never heard of. There’s always something new that’s inspiring to me, even if it’s just one track in a two-hour set. What consistent habits keep you creative? Joey Beltram: I try and do things differently each time. It’s easy to keep going back to things that have worked for you in the past. But that keeps the sound from moving forward. So I try not to repeat myself. Shy Eyez: I started doing my own monthly Noods Radio show in April of last year, and it’s really kept me on my feet as far as digging for new music goes. I also try to spin back-to-back with some of my close friends or even artists I’ve never met in person who travel to NYC for gigs. I think it’s great to feed off of each other in that setting. How have your music collecting and creation habits changed since you first got started? Shy Eyez: I think the main goal has stayed the same… Just to find new music! And I don’t mean “new” in the sense that it’s something that just got released or dropped; just anything that I haven’t personally heard or discovered yet. The only thing that has probably changed is that I’m more aware of things that might work for DJing—I’ve definitely been training myself to have a better ear for what might work on certain scenes/dance floors, etc. What makes one of your own DJ sets feel successful to you? Has that changed since you first started? Joey Beltram: I kind of like an eclectic set. A lot of techno DJ’s play a very monotone style of techno, like it’s all one 2 hour long song. I try and play a set that’s more varied but still cohesive. I try and make a bunch of different ideas work in a set. Shy Eyez: I don’t really think it’s something you can describe in words… But for me, it’s just a general vibe I feel when people are enjoying the music at the venue. I also have to give credit to parties that do a great job curating a night; the positive effects of a well-planned night from warm-up to closing set are sometimes overlooked. Does dance music have political potential? Shy Eyez: Of course. But that’s up to the artist and/or listener. Joey Beltram: I think it should be about having fun. It should be a release—something that should be enjoyed by all. What’s special about techno (and/or the techno scene) right now? Shy Eyez: I think it’s very exciting what people like the Zenker Brothers are doing with their label, Ilian Tape. I’m always inspired after hearing their sets because they’re totally unafraid to stray away from the more conservative side of four-to-the-floor techno. Joey Beltram: I think the techno scene is still very strong. There’s more music coming out now than ever before. I think it’s a very creative time in techno and house music. I only wish more of it was being made available on vinyl. There’s too many digital only releases. But I think a lot more labels are starting to take vinyl more seriously. I still like owning the best music on vinyl. What excites you about techno’s future? Joey Beltram: The fact that techno has been going on for 30+ years and it’s stronger than ever amazes me. There’s still amazing tracks coming out every week. And I still really enjoy playing it. Shy Eyez: It’s gotten easier to connect with people all over the world, sharing music that might not be so immediately accessible to others. There’s an amazing chance to build a network outside of your direct, local community—and it could even start simply with a back-and-forth email between two artists on separate continents, nerding out over a forthcoming release on a totally unknown, new label. Technology is obviously a big part of this, so I can only see this network for artists growing exponentially. See Joey Beltram and Shy Eyez LIVE at Good Life on Friday, January 27th. More info here!